Here are a few simple ways of controlling weeds in the organic garden. Of course you are never going to have an entirely weed-free garden but a largely weed-free one is possible and achievable with simple, non toxic methods. Many of us do not want to use harsh chemicals to destroy plants; we are increasingly aware that such simple weed control may have other unlooked for consequences such as harming insects and birds. With bee populations threatened as never before by widespread chemical use and other agricultural practices, we can at least avoid some of these follies in our own gardens. 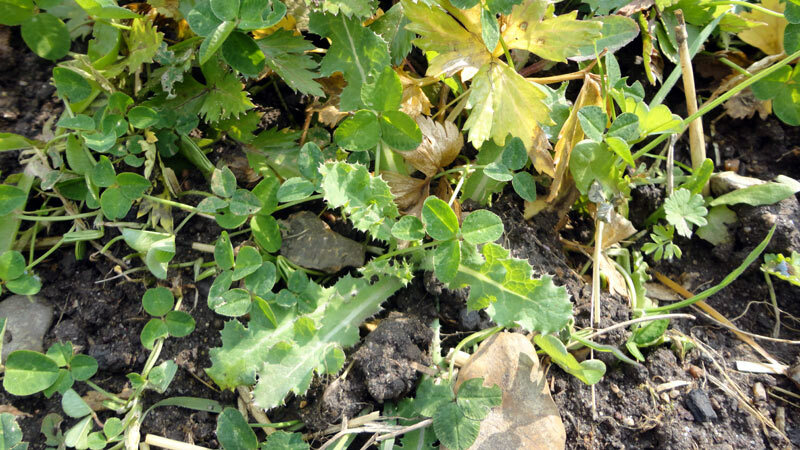 The main methods used here for controlling weeds include mulching with a variety of materials and techniques; cutting and removing seed heads before maturity and selecting good companion plants to help suppress weeds. Here below are the details. You can reduce your weeds by mulching with organic materials and by using mulch mats or weed control fabric. Mulching is the process whereby you spread compost or other organic matter on the soil around plants. Alternatively, you can use inorganic mulches of plastic or other material to suppress weeds. Organic methods have many benefits but plastic can be a great short-term solution for clearing a really weedy patch. First, here are brief details of using organic mulching materials for controlling weeds. Organic materials are best in my view, as they ultimately feed the soil and the micro-organisms that live there. There are many possible candidates for organic mulching material. By organic, I mean materials which are or were alive at some stage and are part of the carbon cycle. - and almost anything which can be composted, in fact. You can suppress a lot of weed growth this way, especially if you use materials which are really free of weed seeds. This is perhaps the ideal mulching material both for controlling weeds and for feeding the soil. If you need to plant new plants you just plant through the mulch. You can buy compost suitable for mulching in garden centres and of course, you can make it yourself. Some plants do not mind a layer of chipped bark or wood chip around them. This tends to suit larger, more established plants. You get the best results for weed control if you use a planting membrane underneath the chipped bark. This preserves the bark chippings for longer and stops weeds coming through. You can use wood chip as a mulching material directly on top of the soil. Wood chip and chipped bark can tend to leach nitrogen from the soil initially, so this is not a good choice for young plants or for any plant which needs to grow fast. Woodchip can be mixed with manure or compost to get a richer, more nitrogen providing mix. We did this in our community orchard and it seems to work quite well. Couch grass does seem to keep spring up through the mulch from time to time; it is better to be rid of this robust weed before mulching with anything organic. Dead wood can also be a useful mulch for controlling weeds. The wood continues to break down, contributing valuable organic nutrients as it does so. Decayed wood is weed free and can provide a good deal of protection. Relatively undecayed wood will also help suppress weeds and retain moisture around larger plants. I've used pieces of found wood to mulch around fruit trees with some success. The wood will never totally protect the trees from weeds as they grow between the pieces but the wood certainly helped to keep the weeds in check. It also provides some protection for the soil from drying winds and sun. Slugs also find a handy habitat, so choose this for larger, slug-hardy plantings only. Straw is very easy to use and is surprisingly effective. Weeds growing beneath the straw seem to be much less dense and well-rooted and therefore they are a lot easier to pull by hand. One potential downside of straw is that many farmers now use growth-inhibiting hormones to slow the growth of the stalks of wheat and other grains. These chemicals can also suppress the growth of your plants. The effects should wear off after a period so old straw that has sat out in the rain will almost certainly be better. Don't be tempted to use hay as it will almost certainly contain far too many seed heads and will therefore cause more problems than it solves. Leaf mold is an ideal material for controlling weeds. Make it regularly and use it freely. Here's how. Well-rotted manure is a great aid to growth and will stop many weeds, too. Be careful not to use fresh manure as it will harm plants, even burning the stems and leaves. Grass collected from mowing the lawn can provide nitrogen and some weed suppression. It does tend to become slimy if it used without mixing it with anything. Newspaper is useful for mulching but coloured parts may contain undesirable chemicals. Some modern newspapers use soya-based inks which will be fine. Cardboard is a fantastic mulch material as it gradually breaks down harmlessly and adds to the soil. Large pieces from packaging can be saved andused in your garden for a variety of purposes, including mulching around fruit bushes and adding to the compost heap. Use just plain brown cardboard for any purpose where it is going to break down into the soil. I've not yet used seaweed or moss in anything but tiny quantities. Moss holds water well. Seaweed runs the risk of being too salty; it may need washing before use. It is a valuable source of all kinds of nutrients. See this page for an excellent rundown of its benefits as mulch. You can also buy light-weight mulch matting which is specially designed to act as a weed suppressant while letting moisture in. This is especially suitable for vegetable growing areas and soft fruits. You can cover it over with top soil or other materials so that you don't have to look at ugly black plastic. Black plastic is also fine for denying light to weeds on an area that you intend to plant later. Continuous sheeting is best as it excludes light most effectively. However, you can do a lot with recycled compost bags or other recycled plastics. You just need to ensure that your chosen materials are well-secured and over-lap enough to deny the weeds any light. Any weeds that do succeed in poking through between pieces of plastic will be weak and etiolated and so realtively easy to dig out. Some plants may do well with scattered gravel or shingle. This approach is more suitable for dry areas with plants which conserve moisture well. Stones, shingle and even sand can be good aids to moisture retention. These mulching materials do not significantly improve the soil as the breakdown of the minerals in stones is a very slow process. You can also use well-chosen plants to suppress and out-compete other plants. Tagetes, for example are brilliant companion plants and they also help deter difficult weeds such as couch grass and ground ivy. Don't expect instant results, though! Other ground cover plants may have a role, depending upon what you are trying to grow. For example the "three sisters" is a planting trio of climbing beans, squash and maize popular among north American native peoples. Grown together, these plants can help suppress weeds and provide shade and ground cover for each other. The squash provides ground cover and shade for the young sweet corn and bean plants. Lots of other combinations are possible. Forest gardens, for example, are grown on the principle that larger plants will help provide shade and weed control for smaller ones. Another similar technique is to use dense planting to cover the ground between your crop plants. The danger of this is that you will deprive the crop plants of some nutrients and moisture. Nevertheless, communities of plants often do rather well together. Bare soil is unusual in nature and is quickly filled by new growth. Planting ground cover between crops does something similar; by planting a chosen ground cover plant you are suppressing the weeds. Another advantage is that you can choose a plant for its compatibility and its contribution to your harvest. I plant hairy bittercress between lettuces as a catch crop salad materials. It is very easy to remove when needed. 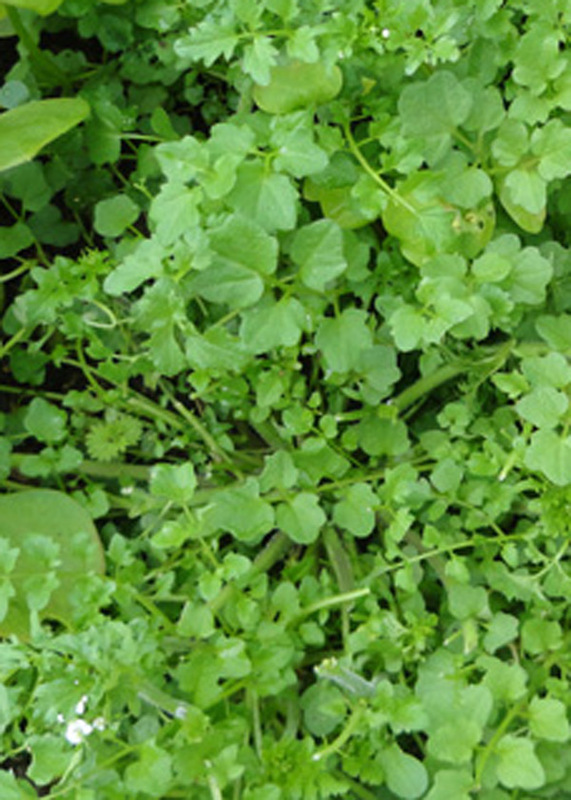 Nitrogen fixing plants such as clovers can be useful between crop plants as they help feed surrounding plants. In flower borders it is good to encourage undemanding ground cover plants between larger perennials. Picture: Hairy bittercress - a most useful "weed" which can provide a fair amount of ground cover between salad plants. You can also wage an eco-friendly war on weeds simply by cutting them down before they get to maturity. This helps because you thereby prevent them from seeding. Many common weeds such as dock and red dead nettle can spread literally thousands of seeds from a single plant. Cutting down weeds does not remove them, of course. But it makes it easier to mulch them effectively. Even mulching with straw after strimming away the plant tops will help reduce the overall weediness of a plot. Alternatively, you can use black plastic to exclude the light for a while. This will make the weeds more fragile and easy to remove. Many of the smaller ones will be killed. Leave the plastic in place for several weeks, ideally. Once you have chopped or stimmed your weeds, you need to compost them effectively so that they cause no further trouble and add to the fertility of the soil. Hand weeding is well worth doing in among established plants - but as it is a bit tedious and time consuming, it's really the last method on my list of ways to control weeds. Once you have a well-planted and established organic garden, controlling weeds with the other methods outlined above is relatively easy. Weeding by hand is much easier if you strike early - and reasonably often. Use the drier parts of spring to make sure that your weeding programme is effectively keeping weeds to a minimum. Only leave pulled weeds on the surface if the conditions are quite dry. Many weeds are really quite good at re-establishing themselves! 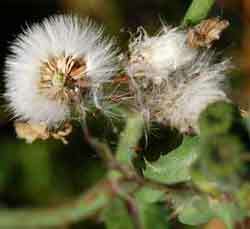 See the pages on weed identification for more on how to deal withy specific weeds. Regular hoeing between rows of vegetables can be a fast and effective way of controlling weeds. Again, remove the plants from the scene to stop them re-rooting. Weeds are some of the most hardy and robust plants for local conditions and will easily out-compete most garden species that you want to establish in your garden. Don't forget you can also recycle your weeds for the most part by composting them or by using them to build green banks in your garden. But most simple grasses and annual wildflowers can just go in the compost bin, especially if you can make compost which kills seeds. If you have a lot of dock, ground elder or couch grass to deal with, it is possible to recycle them effectively as compost. Wrap them in a large sheet of black plastic until they break down. You have to be really vigilant with these invasive weeds; small chopped up pieces of root will very often sprout into life and soon become big and bossy. For smaller amounts just put them into an ordinary strong black bin bag, exclude all light and leave them for up to a year. After that you can add the contents to the compost bin or straight back onto the soil. Alternatively, you can take no chances and just burn them - but this is only practical for small numbers of weeds. You can make weeds sweat and disintegrate in a plastic bag if you leave them out in the sun. For best results use a black plastic bag to help absorb the suns rays. Wait until the interior is like a soup before adding it to the compost heap. Controlling weeds with a natural weed killer? Can you buy organic weed killer which is really harmless to the environment? I've not found any so far but I probably have not yet looked very hard. "Roundup" (Glysophate) has a reputation for being relatively eco-friendly - one which is entirely undeserved, in my view. See NourishingLiberty for more on this. Dr Mercola also has many shocking truths about the use of Roundup Ready GMOs and the likelihood that Roundup is causing Alzheimer's disease. If you want to gen up on why such weed killers are a terrible idea, both for home gardens and for agriculture and for our food supplies, check out either of these sites. Vinegar has a reputation for killing weeds if applied neat. I have treated the occasional weed this way with some success. You can also use salt as a natural weed killer but be careful not to do this too much as salt is destructive of many soil organisms and you could kill more than you intended. Salt has been used in wars to poison land; if you use it as a weed-killer be very selective indeed. Controlling weeds need not be difficult if you use mulches effectively and do not let weeds run to seed, as explained above. If you use salt or vinegar for controlling weeds, use them just as a very occasional support to other efforts. Really, I think they are very rarely needed! This is just a very brief introduction to a rather large subject. Controlling weeds is much easier if you can identify them!